Beans, corn, and ancient grains such as rice and amaranth form the foundation of the Mexican diet. The corn tortilla used for the shell in this recipe helps you be gluten-free without sacrificing taste. Credit: ©T.J. Hine Photography, Inc.
Make the tortilla shells and set them aside. In a large skillet, brown the beef in the oil over medium-high heat, breaking up the meat with a fork. Stir in the taco seasoning and water. Add the kidney beans and simmer the mixture gently until the moisture has been absorbed, stirring occasionally. Remove the skillet from the heat. Cut the lettuce crosswise into thin strips and place it in a large bowl. Add the green onions, tomatoes, cheese, ground beef, and dressing; toss the ingredients to blend well. 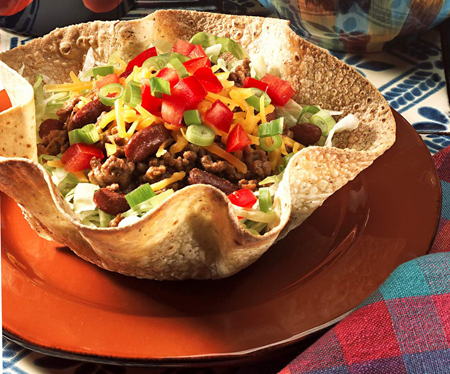 Serve the salad in the tortilla shells. Preheat the oven to 400 degrees F. Wrap the tortillas in a damp paper towel. Warm them in the microwave for 15 seconds to soften. Spray the outside of a 6- or 7-inch round glass bowl or baking dish (large custard cups work great) with the cooking spray. Mold 1 tortilla over the bottom of the inverted bowl or baking dish. Bake the tortilla for 15 minutes, or until the tortilla is very crisp and lightly browned. Carefully remove the shell from the bowl and set it aside to cool. Repeat Steps 3 and 4 with the remaining tortillas. Per serving: Calories: 645; Total fat: 39g; Saturated fat: 13g; Cholesterol: 105mg; Sodium: 1,415mg; Carbohydrates: 39g; Fiber: 6g; Protein: 37g.